Took advantage of the beautiful weather on Wednesday afternoon to break in the barrel of a new .223 AR-platform rifle. 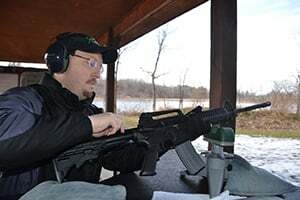 Outdoor News columnist and blogger Tim Lesmeister and I found two other parties hammering away at the Minnetonka Sportsmen’s Club range in Mound as we rattled off nearly 100 rounds through the new DPMS rifle. Google “rifle barrel break-in” and you’ll find page after page of recommendations and flat-out debate over whether the process is necessary. Lesmeister has had several gunsmiths over the years insist that a new rifled barrel undergo a quick break-in process during its first trip to the range. 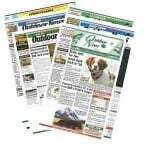 He’s been following their advice for years and believes his rifles have been more accurate and durable as a result. When breaking in a rifle, you’re simply trying to prevent copper fouling from those early rounds from sticking on the barrel’s new rifling as it is smoothed by the bullets. So he conditions that barrel with a simple procedure that’s pretty standard among break-in advocates. Do a quick clean after every shot for 10 shots, then after every two shots for another 20 shots. We gave the barrel a few minutes between shots to cool down before cleaning, and cleaning was by no means complex. After each shot, Lesmeister injects a bit of Hoppe’s bore solvent down the muzzle (he usually keeps a syringe handy for the job), then runs a caliber-appropriate bore snake down the barrel one time. We monitored my group and adjusted sights on the rifle as we completed the process. After those 20 shots, most barrel break-in advocates seem to agree that the firearm is ready to go and requires only standard maintenance and cleaning going forward. We rattled through another 50 rounds, then gave the rifle a thorough cleaning back at Lesmeister’s shop. Checking it with an inspection light, the barrel looked gleamingly perfect. Though I purchased 500 rounds of cheaper ammunition for punching paper with the .223, I bought 50 higher-quality bullets for breaking in the rifle and sighting in. Even my general target ammo doesn’t qualify as “discount” but I wanted quality stuff for consistent, uniform shooting during its first trip to the range. Rifle breaking-in advocates can find ample advice supporting their position as can those calling it a waste of time (or worse). In my experience, I see guys on one extreme who run a rod through their rifle after every 10 rounds and after a decade of shooting, practically own a smoothbore. Too many gun owners probably represent the other extreme and don’t clean theirs enough. Me? I burned a half day of vacation and enjoyed several hours at the range shooting with a friend and colleague on a ridiculously warm December afternoon in Minnesota. Going forward, I’ll clean the AR after every shooting session with my sons and fully expect it to fire accurately (as it did yesterday) for decades. Whenever you’re shooting, remember your gun safety commandments. Then simply enjoy the fact that ammunition prices are returning to the stratosphere and have fun. You can bet if El Niño maintains these moderate temps, I’ll be shooting a lot this winter.